Elation Moving Head Spot Light DJParts - All Variety of Parts that DJ Needs. A new inovation in Automated lighting. The POWER SPOT 575 boast a powerfull 575 discharge lamp in a fixture the same size as the popular Power Spot 250. 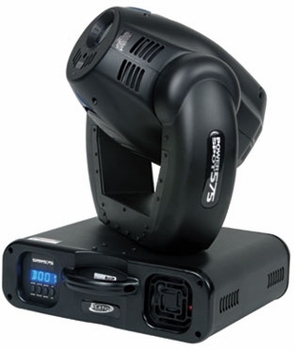 Along with this powerful output the POWER SPOT 575 features 2 Gobo wheels with the popular "Slot-Lot" quick gobo change technology for gobo overlaying effects. The POWER SPOT 575 is the ideal fixture for any venue or event! • Built in Microphone with sensitivity knob. • Fan cooled 1 axial fan for head 1 for base.